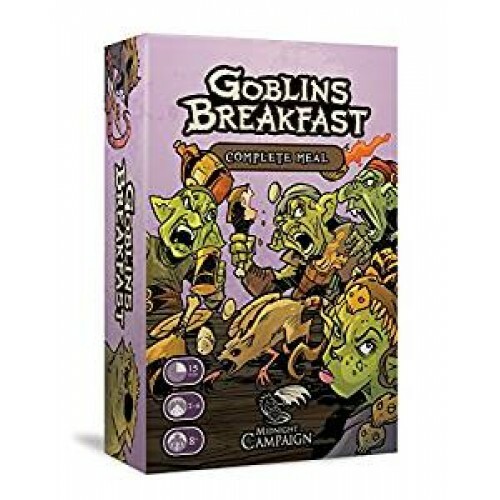 In this fast-paced card game, players play as goblins, taking part in a small arms race to get the best weapons, eat the most food, and steal from their neighbors to prevent them from doing the same. The base game can be played with minimal learning and setup time, takes 15-20 minutes to play, and plays 2-5 players age 6 and up. Gamplay is simple and direct, but strategy varies wildly based on what cards are available, keeping goblins both young and old on their toes. 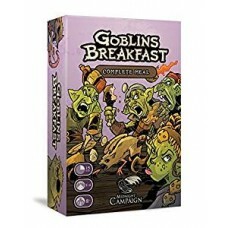 This version of the game is the Complete Breakfast version of the game, initially produced via kickstarter. It includes the base game, a bonus second breakfast deck, stretch goal promo cards, as well as 9 mods, scenarios that change up the way the game is played. This takes the easy to learn mechanics of the base game and adds tremendous depth and variety to keep breakfast fresh every time you play.